Bernard Pollard was originally drafted by the Kansas City Chiefs in the second round of the 2006 draft. A straight inline safety and incredible hitter, Pollard was nicknamed “Bonecrusher” by his teammates at Purdue. The name would follow him to the pros where he’d be involved in ending the seasons of two different New England Patriots. With a brutal blow he’d end Tom Brady’s season in 2008 as a member of the Chiefs, and in 2009 Bernard, playing for the Texans, would be pursuing Wes Welker, when a freak injury would strike Welker sidelining him for 9 months. Although not responsible for the injury, Pollard would still be viewed by many Patriots’ faithful as the culprit. 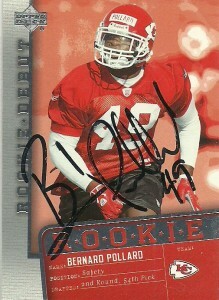 Pollard is a special teams beast- blocking 3 punts in one season with the Chiefs, and 1 for the Texans in 2010. He was also the leading tackler for the Chiefs in 2008. Strangely in 2009 he’d be cut by the Chiefs without explanation, but the Texans – a team in desperate need for defensive help in the secondary claimed him off of waivers. He’d be reunited with his secondary coach David Gibbs and be immediately inserted at the starting strong safety position. Bernard would help turn the Texans around defensively where in 13 games he’d get 102 tackles, 4 interceptions and 2 defensive touchdowns. 2010 would see a reversal of fortune for the defense, and although Pollard would establish himself as a vocal team leader, the secondary would collapse and Gibbs and defensive coordinator Frank Bush would be fired. With the addition of new coordinator Wade Phillips and the conversion to the 3-4 defense upcoming Bonecrusher’s future in Houston became extremely cloudy. Bernard is what is referred to as a ‘straight in-line’ or ‘box’ safety, much in the vein of Roy Williams of Dallas/Cincinnati. Pollard is an exceptional run defender, (something that I love,) but needs help in the secondary when playing the pass. With the demands of the game changing for secondary, and especially at safety, hip fluidity and the ability to turn and cut is now at a premium for the position with offensive passing games in high gear. I do like Bernard a lot and I hoped he would be able to stick around with the team, but the Texans did not tender him in for the 2011 season, and allowed him to test the free agent waters. He currently plays for the Baltimore Ravens.